Parchment baked is my newly discovered favorite way of cooking. Parchment paper prevents food from sticking to the pan and makes cleaning a breeze. The food is cooked in its own juices and you have assurance that it won’t dry out even if a bit overcooked. It is also a great idea for pot luck when everyone can bring their own “mystery” packets. Combine, chopped tomato, shallots, garlic, basil leaves and lemon juice into a small bowl. 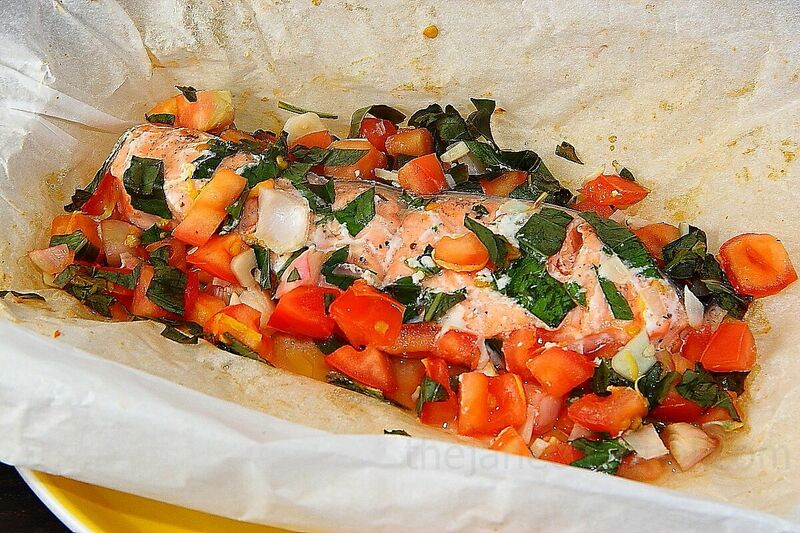 Place salmon fillet in the center of parchment paper. Drizzle each fillet with 1 teaspoon of the oil and half of the mixed vegetables on top. Place packages directly on hot baking sheet in oven at 400 F and cook for 20 minutes.